Tables are in good shape except for peeling vinyl top. Your's was the only source I could find. 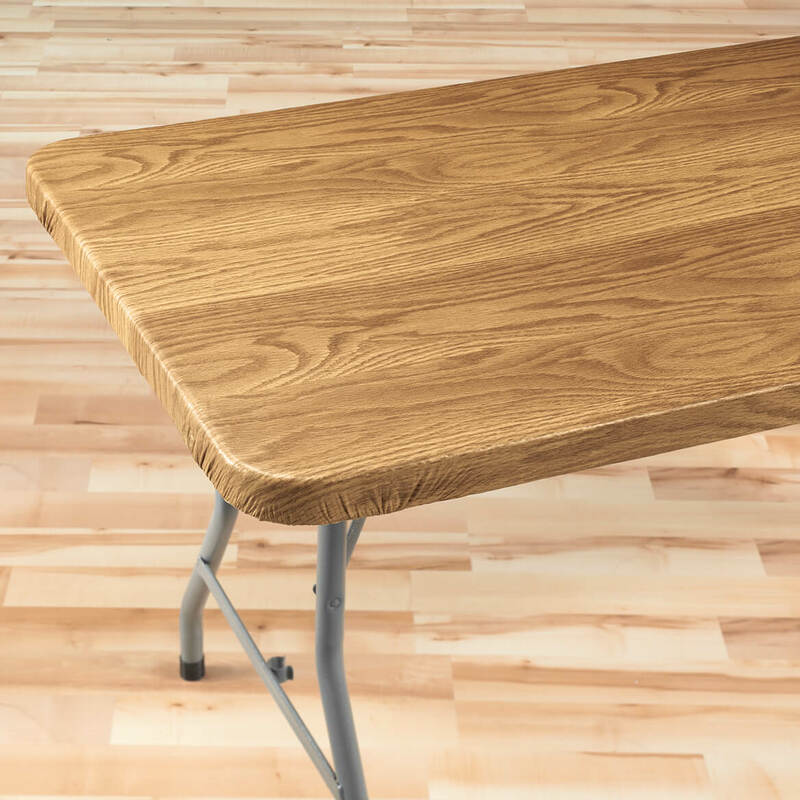 I wanted a vinyl wood grain table cloth because it is easy to clean, will not stain, and it will last a long time. A square vinyl table cloth in the size I wanted is very hard to find and I was excited when I finally found one. I liked the look and wanted to use it on my fold out table when we have all the grandkids over. Hard to get item from other sources. Finally found a cover to fit my card table! 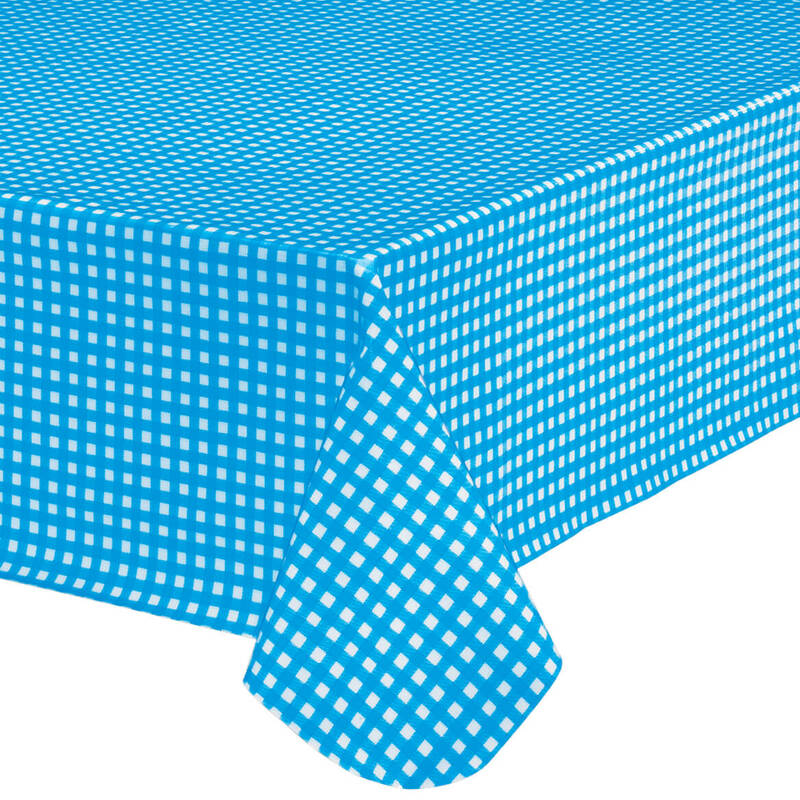 This is a unique pretty small square elastic fitted tablecloth,which are very hard to find. To cover and protect my table. it gives an ordinary table a better look ive ordered several of these covers for both round and oblong tables they are great!! great buy!! To cover my table without my cats taking it off. Library table surface marred...this should fit and improve appearance. First one to come up on search. Need cover for appearance when using table. Looked like it would be a good fit.. I wanted a cover for my table. Playing bridge and needed cloths to protect my glass top tables. We needed covers for our lunchroom tables in our office. These look like they would hold up well and make cleanup easy. I wanted to protect the top of my card table while crafting. Just giving it a try. looks like just what I need to provide protection for my 34 inch square folding table......will hope it will fit it! my 2 tables needed fitted coverings due to wear and tear, the wood grain matches the tables tops. hope they look and fit as good as the photo!! "I choose this to match other items in my kitchen." I needed an elasticized table cover for playing mah jongg and looked all over the internet and found Walter Drake's ad. This is a company that I know and trust and the selection was just what I wanted. I have one that has hole in it need to update to new one form here. I needed square card table covers that keep my card tables like new and are easy to clean. does an oblong elasticized table cover fit a rectangular table? BEST ANSWER: Thank you for your question. No, the oblong table cover is not design to yet a rectangular table. We hope this information will be of help to you. 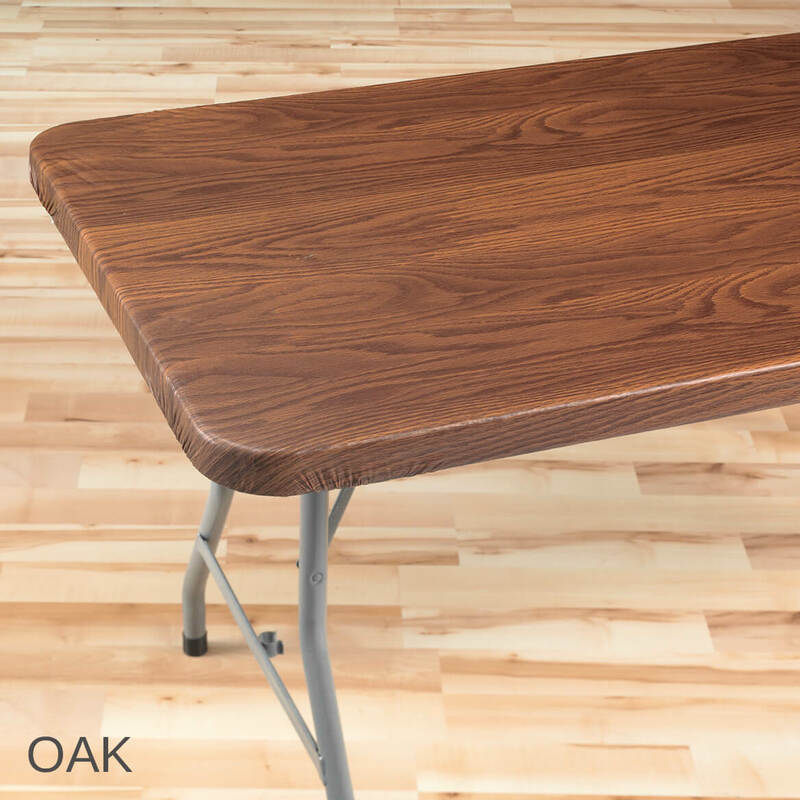 looking for table size 42x 60 tablecloth in oak do you have tablecloth that will fit this table size? BEST ANSWER: Thank you for your question. 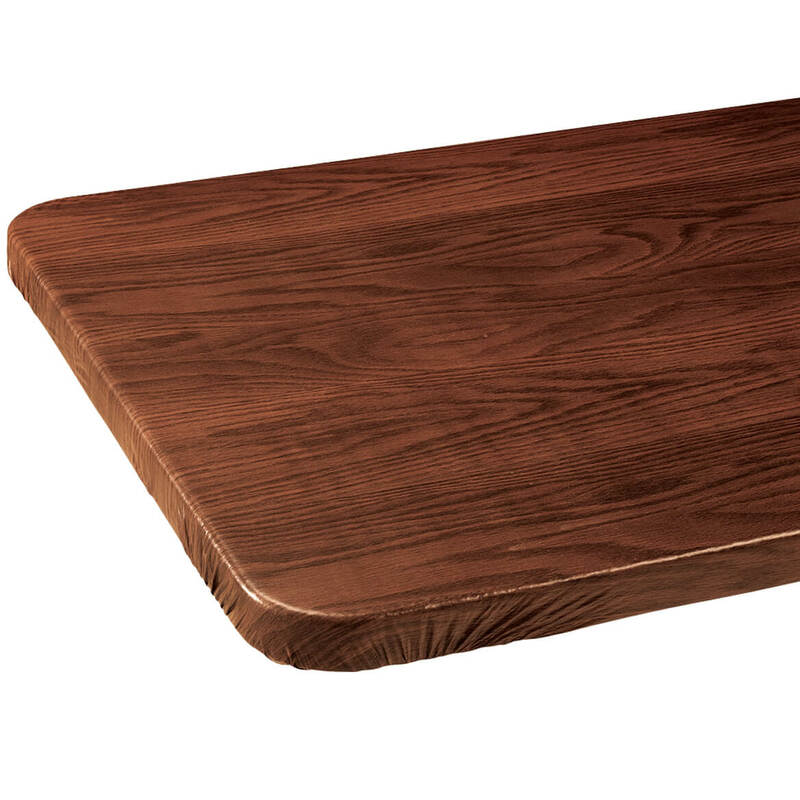 Unfortunately, we do not have a rectangular table cover that will fit a 42" by 60" table. We hope this information will be of help to you. which is lighter oak or pine? BEST ANSWER: Thank you for your question. Pine is the lightest. We hope this information will be of help to you. Is this the oak color? BEST ANSWER: Thank you for your question. The oak style is the medium color. The darker color shown in the first picture is mahogany. We hope this information will be of help to you. My rectangle table is 30" by 48"; which elastic table cover would fit best? BEST ANSWER: Thank you for your question. The 30" x 60" should fit, you just may have extra material as there is a 12" length difference. We hope this information will be of help to you. Do these table covers fit a square table? BEST ANSWER: Thank you for your question. 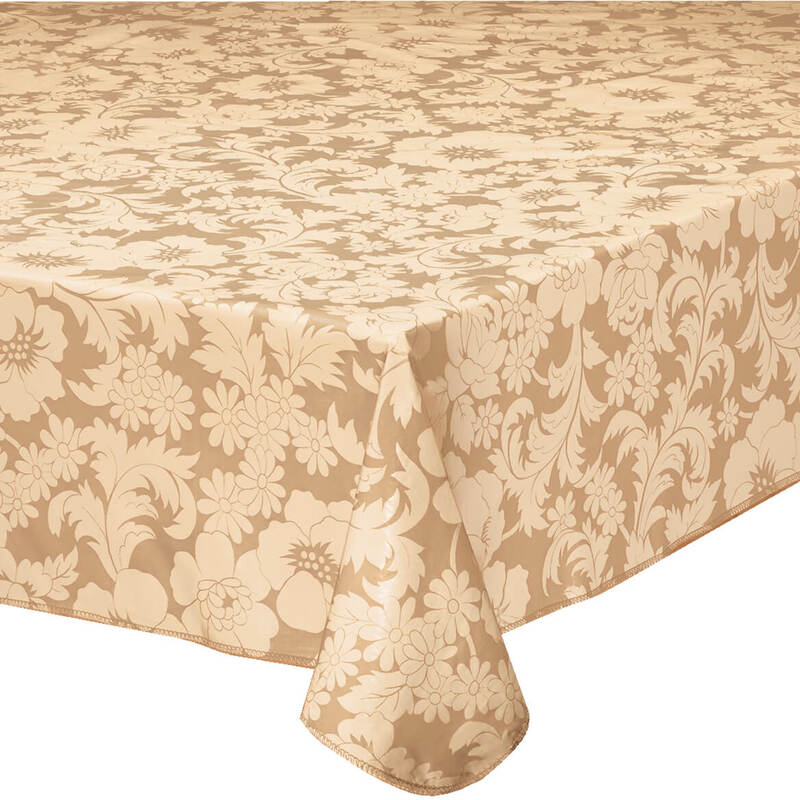 The square banquet table cover fits tables 36"x36". Small rectangle fits tables 48"x24". Medium rectangle fits tables 60"x30". Large rectangle fits tables 72"x30". We hope this information will be of help to you. My square tables are 34" and 35". Will the 36" square be snug enough to stay in place? BEST ANSWER: Thank you for your question. It ill fit, the elastic underneath will keep a tight fit to it. We hope this information will be of help to you. 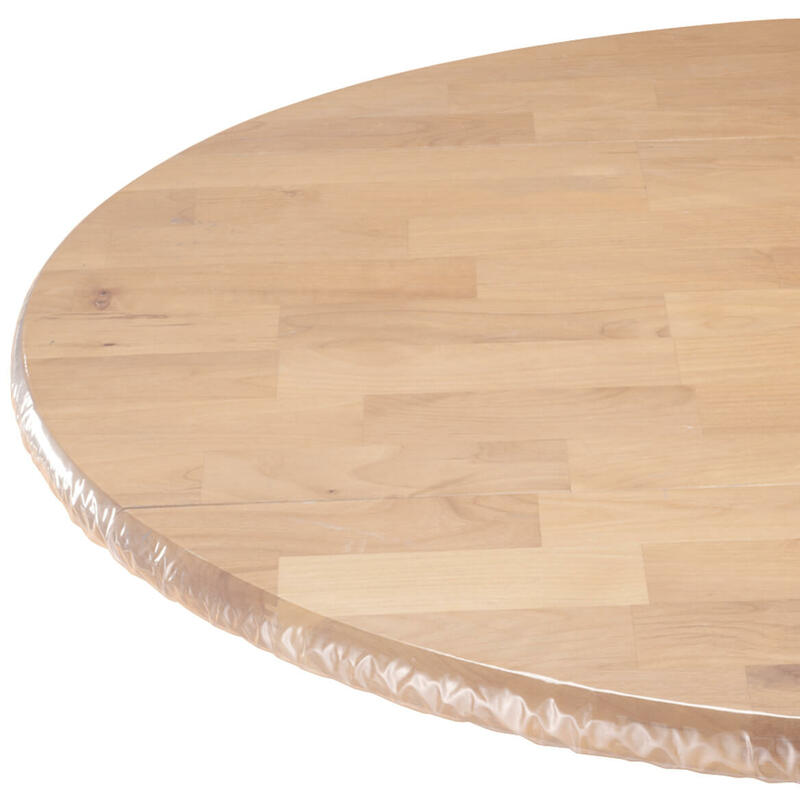 need 72" round wood grain table covers ? BEST ANSWER: Thank you for your question. 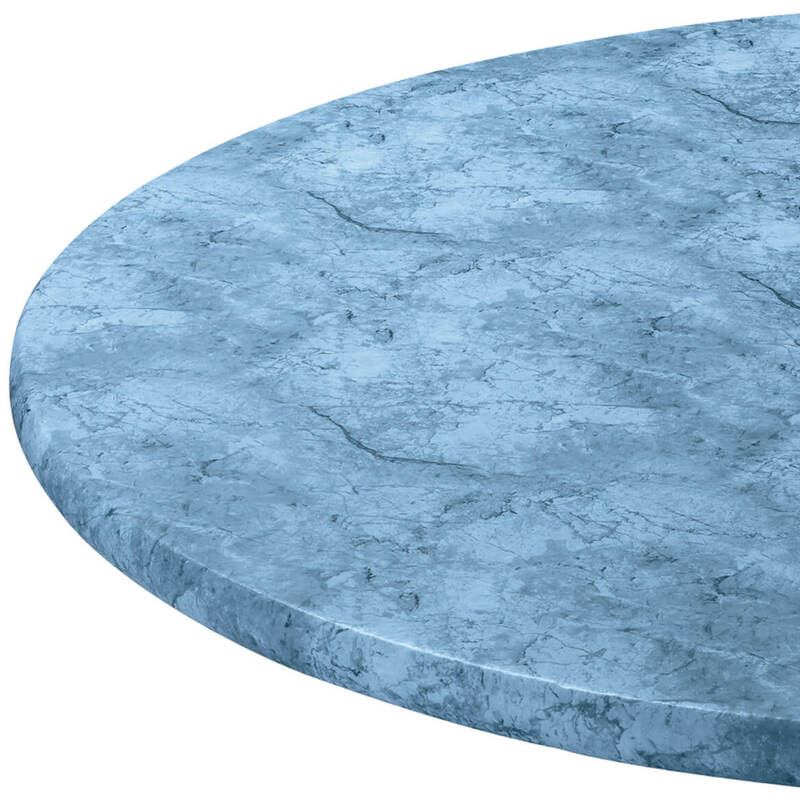 We do not sell a round table cover that large. We hope this information will be of help to you. my table size is 48x36. which elastic table cover would fit this well? BEST ANSWER: Thank you for your question. We do not carry a table cover that will fit that size of table. We hope this information will be of help to you. my table top measures 36x60 what size elastic fitted table cover would I order? BEST ANSWER: Thank you for your question. Unfortunately none of the table covers will fit. We hope this information will be of help to you. How deep are the edges? BEST ANSWER: Thank you for your question. 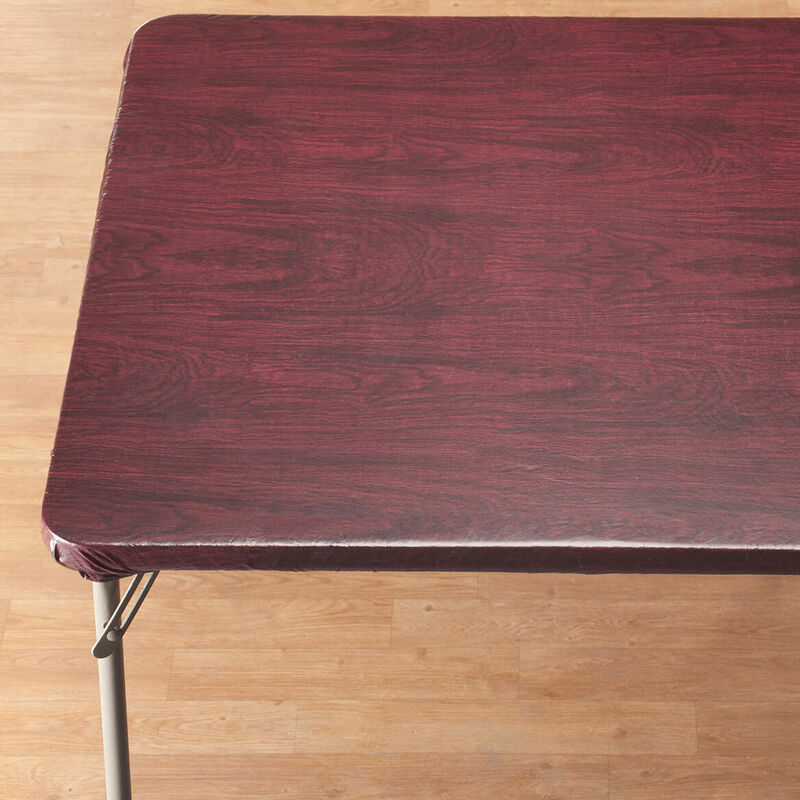 There are no edges, the table cover is elasticized and the elastic goes under your table. 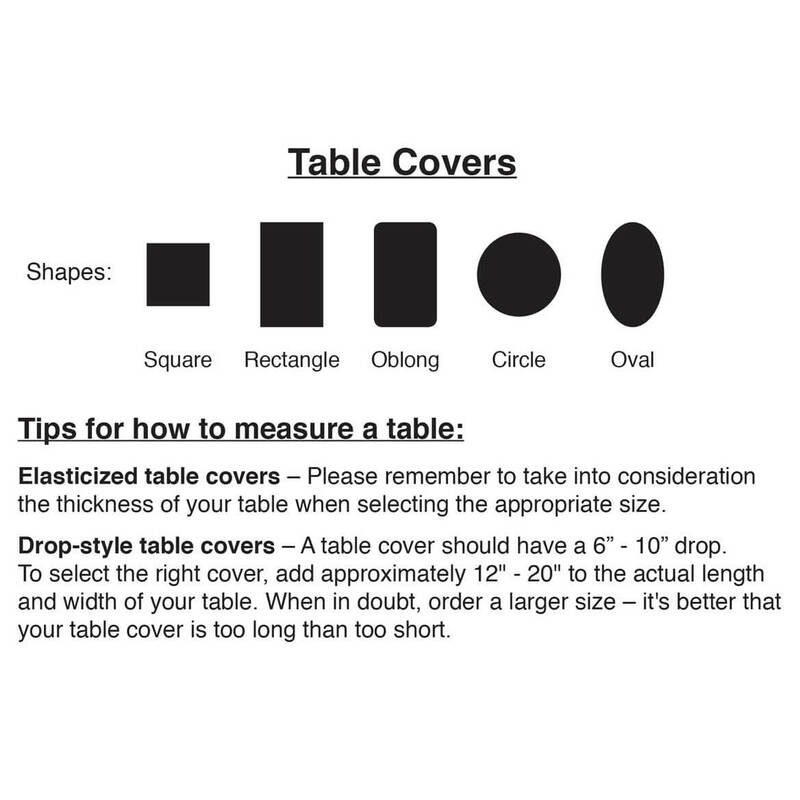 Just measure the length and width of your table and order the corresponding size you will need. We hope this information will be of help to you. do you have a 42x42 tablecloth? BEST ANSWER: Thank you for your question. We do not have that size table cover. We hope this information will be of help to you. Do you have any tablecloths for 96" x 18"? BEST ANSWER: Thank you for your question. Unfortunately we do not carry any table covers in that size. We hope this information will be of help to you. This product available in any store? BEST ANSWER: Thank you for your question. Unfortunately no we are a website and catalog based company only. We hope this information will be of help to you. Can i get this in a custom larger size to fit a 9 foot table? BEST ANSWER: Thank you for your question. Unfortunately we do not make custom sizes for the table covers. We hope this information will be of help to you. I would love to have this item but my table is 65 by 41. Do you have a cover to fit? 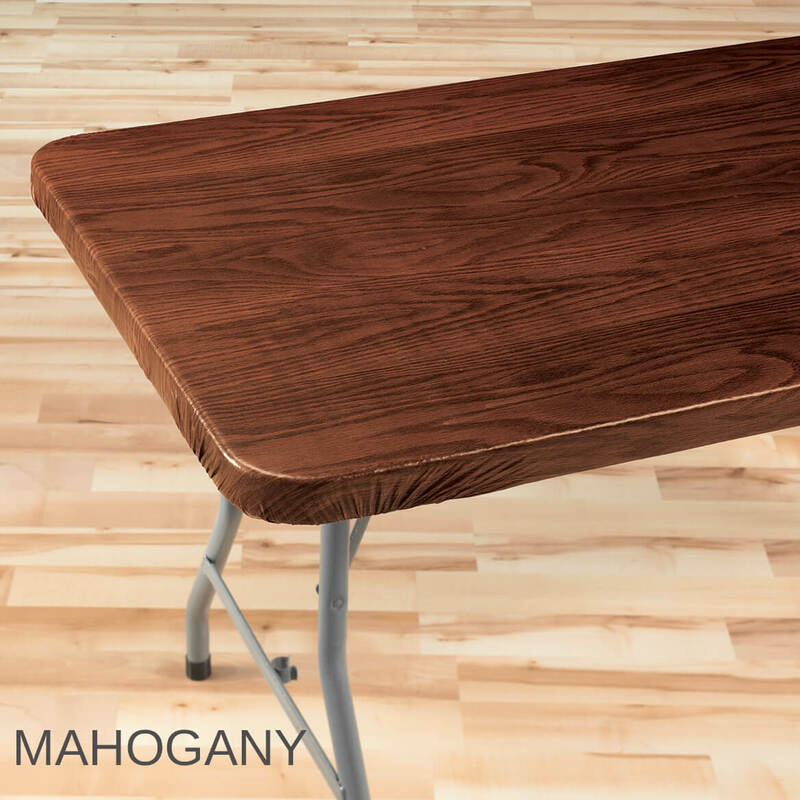 I need the Mahogany. BEST ANSWER: Thank you for your question. Unfortunately we do not carry a table cover that will fit your table. We hope this information will be of help to you. 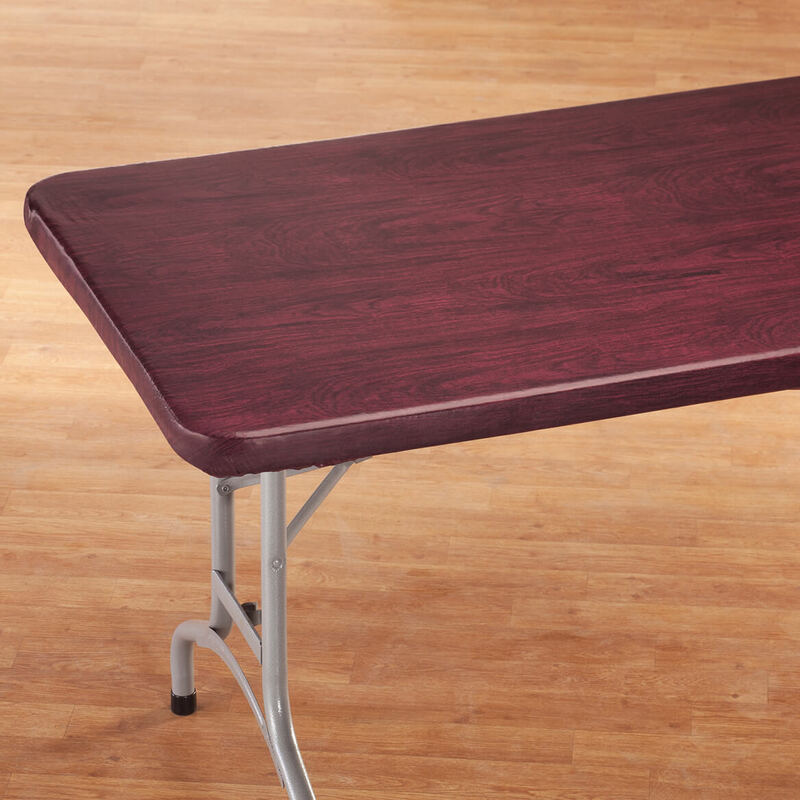 My table is 54" by 42" is there a fitted cover that will fit it? BEST ANSWER: Thank you for your question. Unfortunately we do not have any table covers that will work for you. We hope this information will be of help to you. Will the 36 inch square table cloth work well on a 34 inch card table? If not is there someone making a stretching cloth to fit a 34 inch square table????? BEST ANSWER: Thank you for your question. Yes, the 36" square table cover will fit on your table. We hope this information will be of help to you. 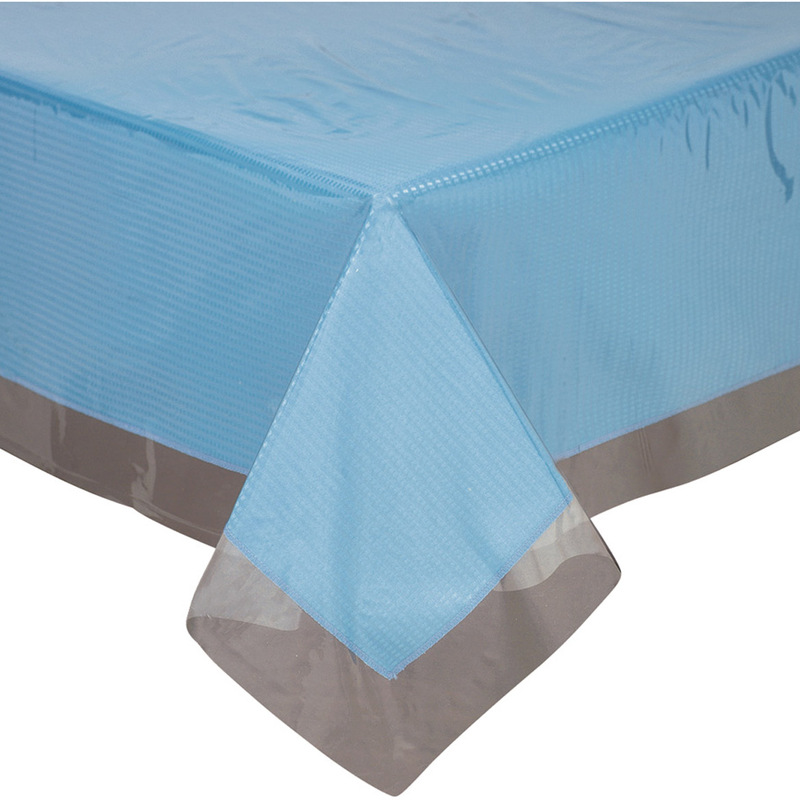 Do you have elasticized table covers to fit a 68.5" long x 40" wide table? I have a 42 inch square table. Do you have any tablecloth for this size? how wide is the side? My card table is 33" square. Would your 36" square fit too loosely? BEST ANSWER: Thank you for your question. No, any extra will go under the table. We hope this information will be of help to you. need 72 x 38 woodgrain dinining room table cloth? BEST ANSWER: Thank you for your question. These are the only sizes we carry for our table covers.We apologize for any inconvenience. Which size would be best for a 50x28 table? The 48x24, or the 60x30?